It is a little sad to see this box now. 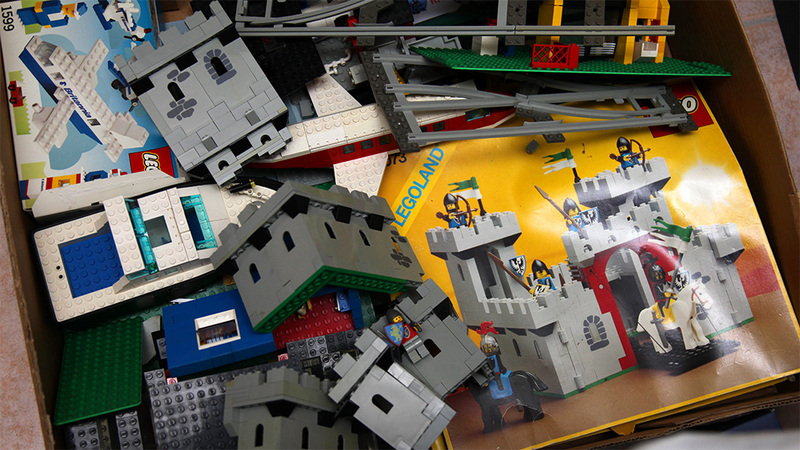 The set obviously meant a lot to me – and partially set in motion the entire quest for Lion Knights’ castle and my AFOL resurgence – but a couple of decades in storage have left it in a “less than mint” condition. Well, apparently I had fixed it with some masking tape already before storing, so it wasn’t in perfect condition then either… However, on the upside, a dried out piece of that masking tape fell off and lead me to an interesting discovery: the price tag. I live in Finland – in northern Europe – and back when this set was released in 1984, our national currency was the Finnish mark. When we were switching to euro, later in 1998, its value was set at roughly 1 euro = 6 marks (one euro was roughly one US dollar back then). So, whatever the price on this price tag, it would be in Finnish marks. Of course, the value of money has changed since. Using a Finnish inflation calculator, I calculated how many euros would 167 marks from 1984 actually equal today. The answer is 55 euros. Also, when adjusting The Orc Forge to match the number of pieces in 6073 Knight’s Castle, its corrected price comes to roughly 78 euros. So, a 400+ piece LEGO Castle set in Finland cost 55 of today’s euros in 1984 and today 78 euros, or around 40% more. Double-check comparison with 9472 Attack on Weathertop results in similar numbers, a tad bit less. The current castle LEGO theme is licensed, so this increases the prices a bit, but even when adjusting for this, the price of the castle LEGO hobby has clearly gone up in my hoods since 1984. No surprise there. One thing has changed for the better since 1984, though. Back then distributors were allowed to contractually set the prices at which retailers sold their products, a practice legally dismantled in Finland later in the 1980s. The current prices at the online LEGO Shop may or may not reflect street prices in Finland, but back in the day the price in the LEGO catalog was the price at every store. So, I believe 167 marks was the official rate for 6073 Knight’s Castle in Finland. I don’t know why, but for some reason knowing this is significant to me. The price tag is a small document of personal history. What else can we construe from the price tag? 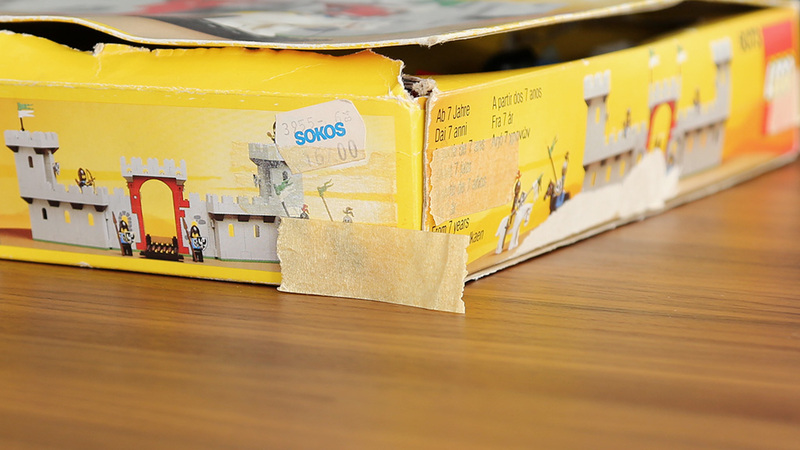 Clearly the label tells us the product was bought from Sokos, a large department store chain in Finland. In Helsinki, their main store is still a block or two away from Stockmann. Maybe this came from there, or perhaps the Tapiola, Espoo branch. The number 3955 is probably just some internal product number for the store, because the model number on the box is 6073. After the price, the second most interesting piece of information is in the top right corner of the tag: numbers 6 and 84. That can only mean the box was priced 6/84, June 1984. Yeah, that fits. I remember carrying the box home on a summer evening and showing it off to a friend, who was playing on the swings outside. No swings for me that night. I was in the land of orange hills and yellow sunsets.